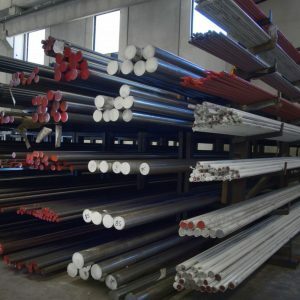 The surface finish of the bars after chrome-plating has a very low roughness, Ra max 0.25 rim, and there are very strict the diameter h6 ISO 286-2, straightness 0.7/1000 mm max, out-of-round lower than half of the diameter chrome-plating concentricity of the plating ± 2 m, hardness HV 800 – 1000, corrosion resistance 200 h rating 9 NSS-ISO 9227. During the first 20 years of the last century, chrome-plating baths were discovered and it was seen that a bath of chromic acid catalyzed for H2SO4 could provide high hardness values, excellent wear resistance, good smoothness and corrosion resistance. The thicknesses of the electroplating range from just a few tm (15-40) to hypothetical deposits of a few tenths of mm (0,7-0,8). A deposit of 1-2 tenths is not recommended, due both to the poor output of the baths and the increased brittleness under impact. It should be noted that the surface preparation before plating greatly influences the smoothness and the bright appea blasted material or a material which has not been satisfactorily pickled will give poor results. Corrosion resistance will be achieved when the chromium deposit is free from porosity and micro-cracks. The bond and the correct thickness will ensure that the d sion does not adversely affect the base product. Some chrome platers even guarantee a corrosion resistance of 300 hours in a salt fog, but the average standards are aI hours. The monthly production of chrome-plated bars in Italy is currently 7000 tonnes, 70% of which for the Italian market and international markets. The most commonly used diameters range from 15 mm to 160 mm, with the most common size being diameter 25 mm. Uses: pneumatic controls for the automotive industry, hydraulic controls, aeronautics sector, food industry, pharma weapons industry, bushings, conveyors, hollow shafts, hollow bodies, nuts, rings, etc.